Welcome from Dennis Dunn! - Bow Hunting by Barebows! Ever since my award-winning book, BAREBOW!, was published in the fall of 2008, many people have been urging me to write a regular BLOG for my book’s website. Well, I’ve finally decided to succumb to their wishes, and my inaugural piece launches this first week of April, 2015. As the first person in history to take all 29 North American huntable big-game animals with a bow and purely instinctive shooting, I believe I have much of value to share with others who aspire to do great things of their own in the hunting world. Regardless of your weapon of choice, if you feel there may still be many “tips” or “tricks” you can learn about how to outsmart a trophy animal in the wild, then this blog column will be for you. For that reason, even a firearm hunter is likely to find this blog-space of considerable interest. Especially if he or she thrills to the chase, and enjoys the challenge of outsmarting the prey- animal’s much keener senses, so as to remain undetected at close range until — finally — the ardently-hoped-for “moment of truth” is suddenly at hand. 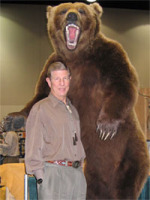 I will say right up front that one of the major goals of this blog will be to help gun hunters sharpen their skills in the field, so that they become less reliant for success on superior marksmanship and more reliant upon their genuine stalking abilities and the honing of their predator-system of instincts. Of course, once a firearm hunter makes the transition and discovers that producing “close encounters of the furry kind” is a CHOICE which is eminently doable — providing one has developed the necessary skills and PATIENCE to “make them happen” — then a sea-change is likely to occur. That is the reason so many rifle hunters eventually switch over to a bow and remain committed to that choice of weapon for the remainder of their hunting lifetime. I caution the reader against assuming that I am anti-gun hunting. That is not at all the case. The challenges of hunting, however, are all about what restrictions one is willing to place upon oneself and one’s weaponry, so as to give the wild animals (particularly the trophy-quality ones) more than just a sporting chance of surviving the contest. Few record-book animals are come by easily in the field, and — in the rare cases where they are — they’re never prized or valued by the successful hunter the way they should be. In a week to ten days, I will publish my first major essay on this blog-site. It will be titled, “Why I Hunt Barebow, Always Have, and Always Will!” I can assure the reader it will provide much food for thought, as well as some entertainment, to boot! Be sure to check back ink a week or so.